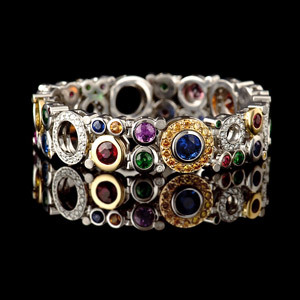 Have you ever wondered about the history or custom behind the most commonly worn jewellery adornment….the wedding ring? As we discovered researching this topic, history and its facts can be skewed where evidence and fact was not readily documented. Thankfully our historical heroes the stars of the beginning of this story can be bestowed with many founding discoveries such as inventing paper, and therefore they documented such historical facts for us to explore and decipher in the future. 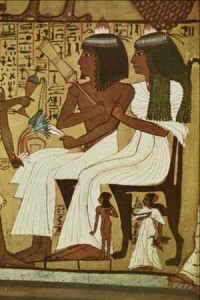 Yes the Egyptian culture, circa 2800BC, the most advanced civilization for nearly 3000 years, can not only be credited with creating the worlds earliest peace treaty, they were famed builders inventing the earliest forms of plumbing and irrigation, they discovered khol which both men and woman wore and which is now worn by nearly every woman in today’s society, it is also well documented on their papyrus scrolls that they used hemp, rushes or reeds to symbolise the tying of the knot. Interestingly this is not where the expression comes from, that is a story for another day. 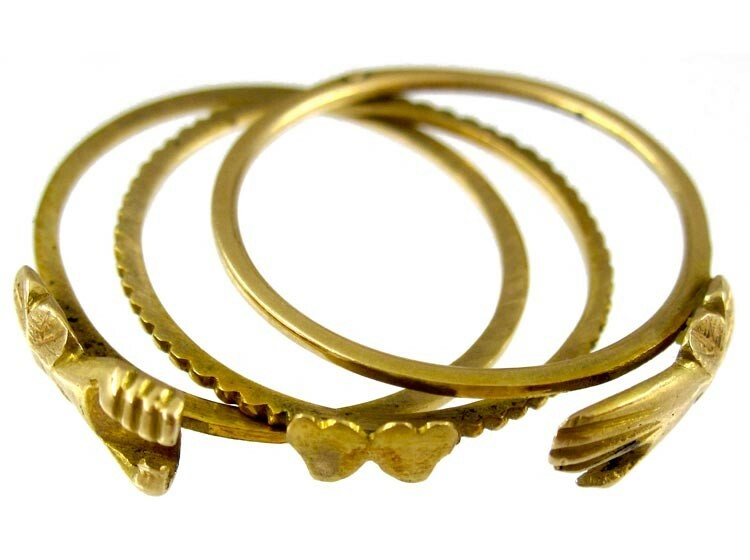 Egyptian relics show these hemp or reed rings being exchanged between wedded couples. 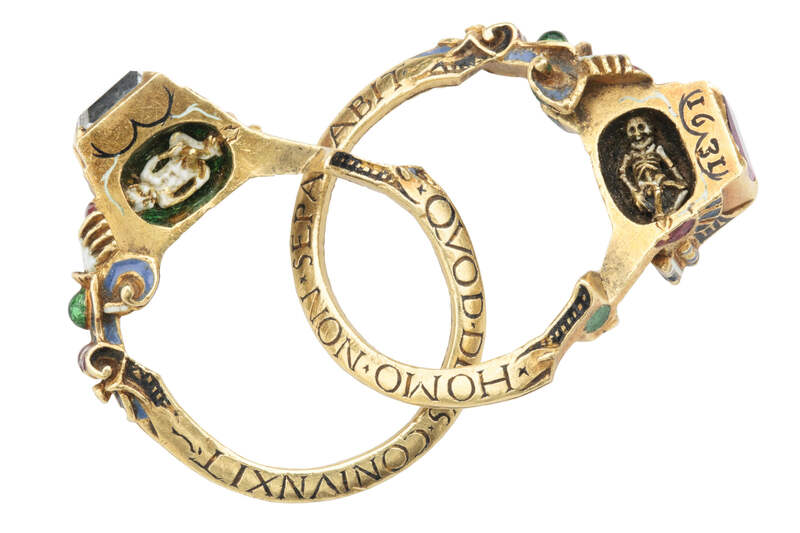 These relics also show they believed the circle was a symbol of eternity which in term became a metaphor that the continual circle of the ring signified a never ending love between the two betrothed. The more modern concept of this tradition would be the phrase “till death do us part”. The whole in the centre also had much significance, it was considered as a gateway or a door which may lead the wearers to events that would be both known and unknown. Another symbolism that no newly married couple knows what the future will bring. The Egyptians obviously had some romanticism in their customs as the tradition of placing the wedding ring on the finger of the left hand comes from the belief that finger housed a special vein that ran directly to the heart, the Vena Amoris which is the Latin term for Vein of Love. 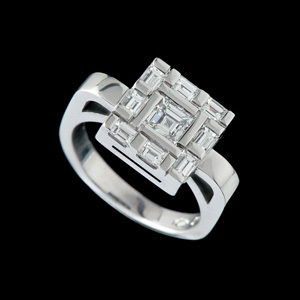 All these beliefs thus signify that to give a woman a ring it epitomises a never ending immortal love. As can be well imagined reeds and rushes would only have a short life span, eventually the tradition of reed rings turned to giving rings made of leather, bone or ivory. It was considered the more lavishly expensive the material the more love shown to the receiver. It would also demonstrate the wealth of the giver. Besides these ceremonies being well documented and the earliest records showing the Egyptians wearing these symbols of devotion to another person, the public pledge to honour ones self in a marriage contract did not become customary till Roman times. However unlike the Egyptians where the ring was the symbol of love, it is believed the Romans viewed these bands as symbols of possession. Roman men would claim their woman with the giving of a ring. 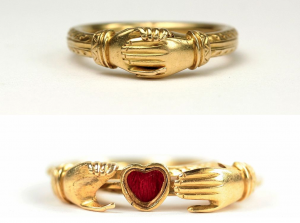 Placed on the left hand, which was considered the weaker side of the body and symbolised the submission of the woman to the man. This tradition is kind of reminiscent of pre historic cavemen who tied cords of braided grass around his chosen mates wrists, ankles and waist, it is thought they believed this bought her spirit under his control. Even though the Romans lack of romanticism seems apart in these earlier times eventually betrothal rings were made from iron and called “Anulus Pronubus”. These rings symbolised strength and permanence and show maybe they developed a softer more romantic notion of the ideas of marriage. 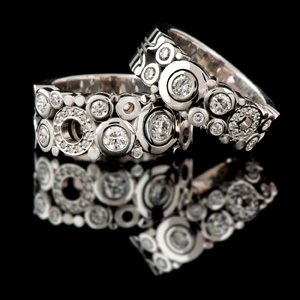 Those early iron rings led to the tradition of wedding rings being made of gold or some other precious metal. 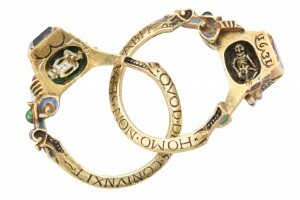 The Romans were also the first to engrave their rings. Our story now leads us to the medieval era where the custom of wearing a wedding ring did indeed spread wider throughout Europe and was adopted by different civilizations and religious groups in many forms of its original concept. We see the plain gold ring transcend into more intricately detailed designs as the techniques with which jewellery was created became more technically advanced. 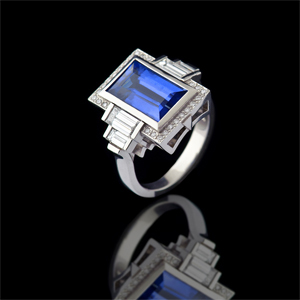 During the earlier stage of this period it was popular for European husbands to bestow a Gimmel or Fede ring to their betrothed. These rings were nearly always wedding or engagement rings but it was also known for men to give them to each other as a sign of friendship. In 1204 Henry III of England gave a Gimmel ring set with a Ruby and a pair of Emeralds to the Count Gysnes as a sign of their royal friendship. The word Gimmel is derived from the Latin Gemmellus the diminutive of Geminus or Twin. 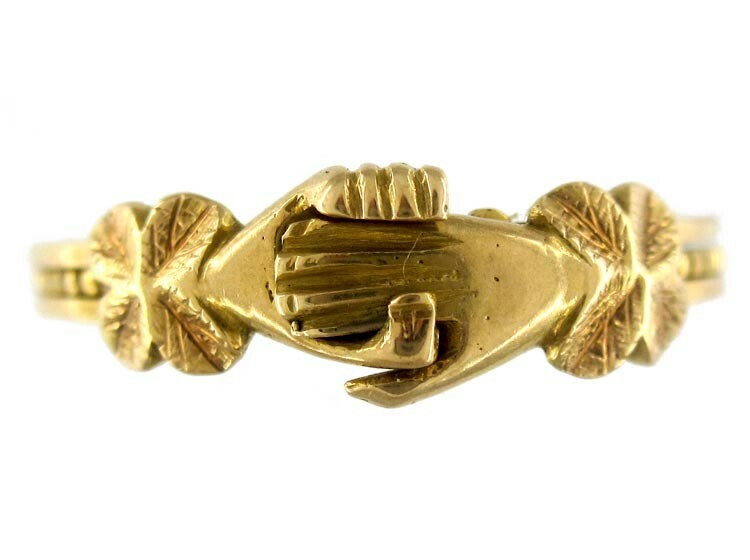 Fede rings were occasionally made in the form of a Gimmel ring with the hands on separate bands and made to link together, but usually they exhibited a pair of clasped right hands either at the front or back of a solid ring. Fede comes from the Italian phrase Mani in Fede which means Hands of Faith. 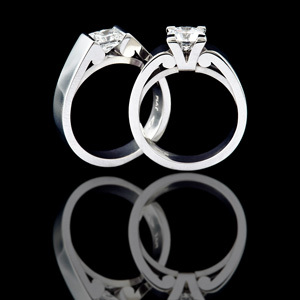 It was customary for Gimmel rings to be worn by both the man and the woman during their engagement. Earlier Gimmel ring designs consisted of two or three small rings that were either intertwined or pinned again with two right hands, one male and one female, that clasped together with the bottom hand holding a heart.Later on more elaborate versions, consisting of up to five or more rings, the tiny pin acted as a pivot enabling the bands to swivel. The separated bands would eventually be reunited during the wedding ceremony upon which the wife would then wear the combined ring. 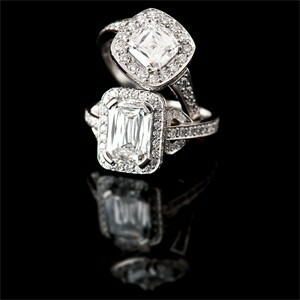 Ultimately all these designs would align to form one ring that would symbolise the union of two people. During the 1600’s and the Cromwellian rule, Oliver Cromwell had already proceeded in establishing Englandas a Commonwealth, he also took it upon himself to try and abolish the use of wedding rings. Fortunately neither he nor his son were successful and British woman continued the tradition of the wedding ring. Originally biblical quotations such as the popular “What God Hath Joined Together, Let No Man Put Asunder” were inscribed on the inside of many wedding bands. 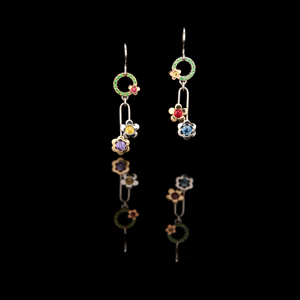 By the end of the 18th century enamel work was being incorporated along with more elaborate designs. Biblical quotations moved onto the engraving of the couples names on the inside of the bands, as well as engraving on the outside of the band also became popular. 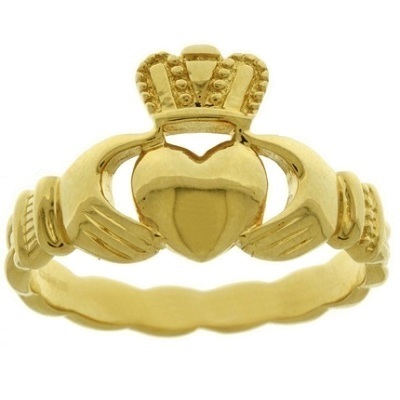 The Claddagh ring is the Irish version of the Fede ring. 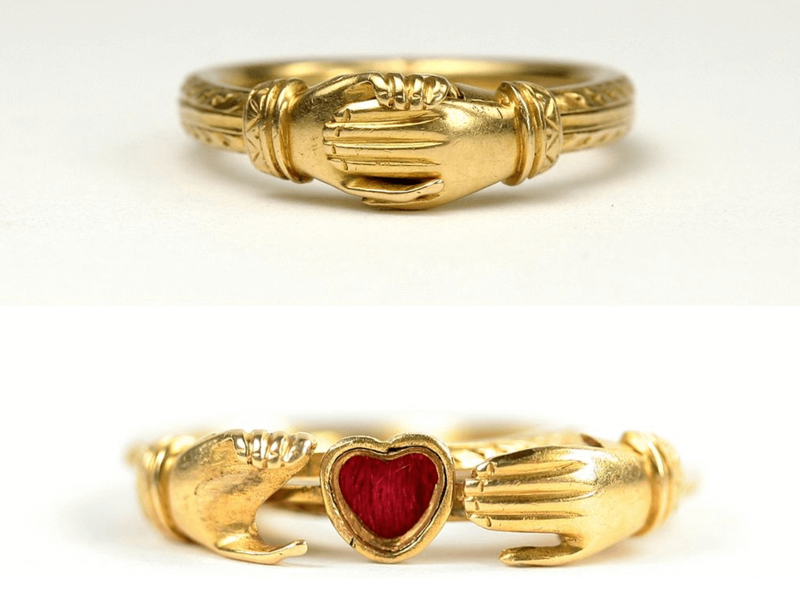 This is however not a series of interlocking rings but one ring with two hands holding a heart and this distinguishing motif is topped with a crown. 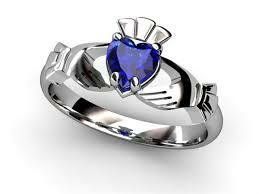 The Claddagh is still made today in the forms of its original versions which date back to the 17th century. 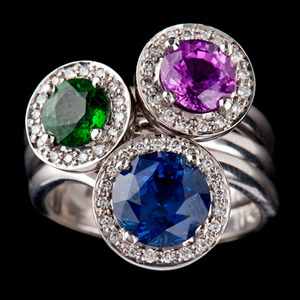 It has become Ireland’s traditional symbol for love, betrothal and marriage. 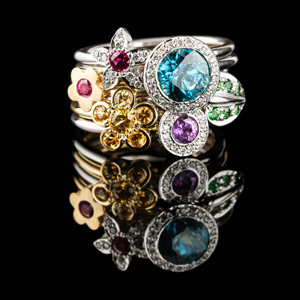 Over the whole of Europe it also became fashionable for a time to have gems set into wedding rings. 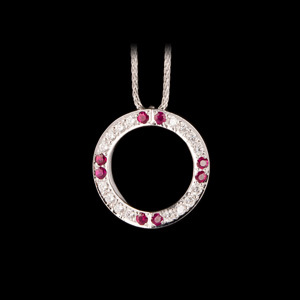 Most had a significance, red Ruby was the colour of the heart, blue Sapphire reflected the heavens, but unsurprisingly the most coveted gem was and still is the Diamond. 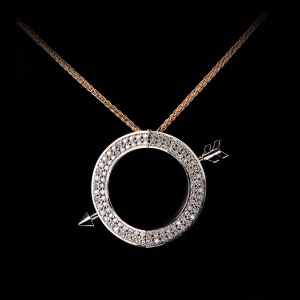 The word Diamond, comes from the Greek word Adamus which means “The Unconquerable”. A fitting description of one of our hardest substances , and an appropriate representation of the covenant of marriage where it represented invincible strength. 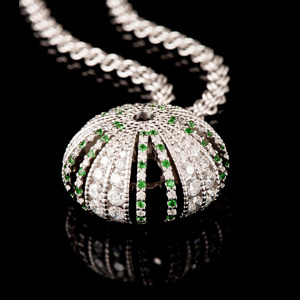 Ancient Greeks believed that Diamonds were delicate splinters of falling stars that offered the wearer power and protection, this is similar to the belief in India where Diamonds were first discovered. America was slow to catch onto the “Double Ring” ceremony, it wasn’t until the 20th century and the beginning of WWII that men began to wear wedding rings, this was mainly as a reminder of their wife back home. It was the possibility of the unknown, if or when they might return. Many couples married in anticipation of separation, the wedding band represented solace for those young men on lonely days, and a reminder for the brides their far away husbands had something to remember them by. By the height of the war 85% of marriages were dual ring ceremonies, today every year, more than 17 tons of gold is made into wedding rings. 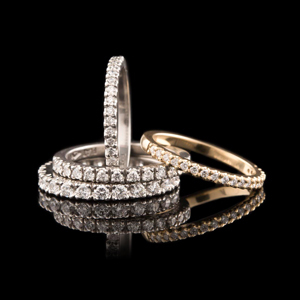 As history shows us the wedding ring is a tradition that dates back many centuries, it is used by many different religious groups and nations and still today there are many different customs and beliefs associated with the wedding ring. Most people wear their wedding rings day and night as a show of their love, thus causing an indentation in the skin that remains visible even when the ring is absent. Could this be the modern day representation of the devotion to ever lasting love?